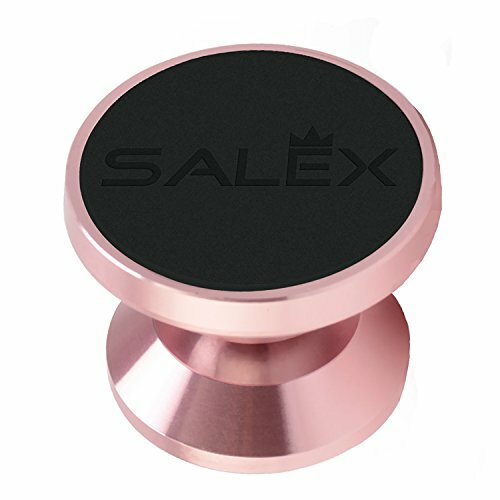 SALEXTM The Best Magnetic Universal 360 degree free rotation adjustable Cell Phone Holder for car dashboard and table or wall in home. If you have any questions about the swivel phone holder, please feel free to contact us for an answer! Clean up the mounting position on your car dashboard (use the wet and dry wipes) before adhering the Phone Holder. Do not put your phone on the swivel mount about 30 minutes to make sure it will stick to the car dashboard steadily. IPhone 10 (X), 8/8 plus,7/7 plus, 6s/6s plus, 6/6 plus, 5/5C/5S| iPad | Samsung Galaxy S8+/S8/S7 edge/S6/Note8/Note5 | Google Nexus | LG | Xiaomi Redmi | Meizu | Huawei | Oneplus and other smartphones, tablets and GPS. Sturdy material and strong magnet. Rose Gold (Pink) Magnetic Car Mount x 1. Wet and dry wipes - 1 pair. Silver Metal Plate x 2. Protective films (1.18x1.18 and 1.97x1.5). Do not worry if you buy a defective product, we will refund your money! If you have any questions, please contact us and we will respond to you. The customer is satisfied, we are satisfied! Thank you for choosing our product. We will be glad to see you again! If you are satisfied with the Magnetic Phone Mount for Car Dashboard, leave a review, please! ≪ WIDELY COMPATIBILITY ≫ | Universal magnetic mobile phone holder for car dash can bear devices weight until 12 ounces (~340 gramm) and it will work perfectly with most majority bands of smartphone with a protective case, small tablets and GPS devices. For example: iPhone X, 8, 8 Plus, 7, 7 Plus, iPhone 6s, 6s Plus, 6, Samsung Galaxy S9, S9+, S8, S8+, S7, S6, Edge, Note 5/4/3, HTC ONE, LG, Sony Xperia, Google Nexus Pixel and other phones and tablets. ≪ QUALITY MATERIAL ≫ | Windshield cellphone swivel mount kit for cars made from high quality aluminum alloy and the four built-in high-power neodymium magnets, which will secure your device from falling while driving. ≪ 360 DEGREE FREE ROTATION ≫ | With a metal ball in the middle of the Cute Magnetic Phone Mount for Car Dashboard, you can freely rotate your phone, tablet and GPS. You can easily receive calls, listen to music and navigate while driving. ≪ UNIVERSAL CAR MOUNT ≫ | Multifunctional magnetic holder can be used not only in a car, but also inside and outside your home. For example, you can to stick the Magnetic Car Mount to a wall or table to hold telephones, keys, knives in the kitchen, small tools in the garage. Each package contains: Pink (Rose gold) magnetic car dashboard phone holder, spare 3m adhesive, 2 pcs of metal plates, 2 pcs of protective films. ≪ 1 YEAR WARRANTY ≫ Enjoy 100% high quallity, ONE year free replacement and lifetime technical support. If you have any questions about the Car Phone Holder, please contact us and we will help you! If you have any questions about this product by SALEX, contact us by completing and submitting the form below. If you are looking for a specif part number, please include it with your message.